It’s certainly not fair to be the victim of another person’s mistake. But if you are, and a crash does occur, there are several steps you should consider taking immediately following the incident. The first thing you should do is examine yourself and others in the crash for injuries. If there are serious wounds, or if anyone involved is unresponsive or unconscious, call 9-1-1 immediately. If you are able to exit your vehicle, examine other vehicles involved. If the vehicles are blocking traffic, move them as far off the road as possible. If the cars are too damaged to move, call 9-1-1 or your local non-emergency number for assistance. If 9-1-1 has already been contacted due to injury, sit tight and wait for their arrival. While you’re waiting for the police or tow truck, swap contact and insurance information with the other drivers. Never leave the scene of a crash without securing each party’s insurance information. If you were in a hit-and-run accident or you hit a stationary object, exchanging information may not be an option. Take pictures if you can to document the scene; your goal should be to gather as much information as you can. You should also call the police. Next, take a few notes on the experience. It’s a good idea to jot down the date, time, location, weather conditions, and any other details you think may be relevant. You may also want to note whether there were any distractions, such as cell phone usage, or if bystanders saw anything that may be relevant to the investigation. 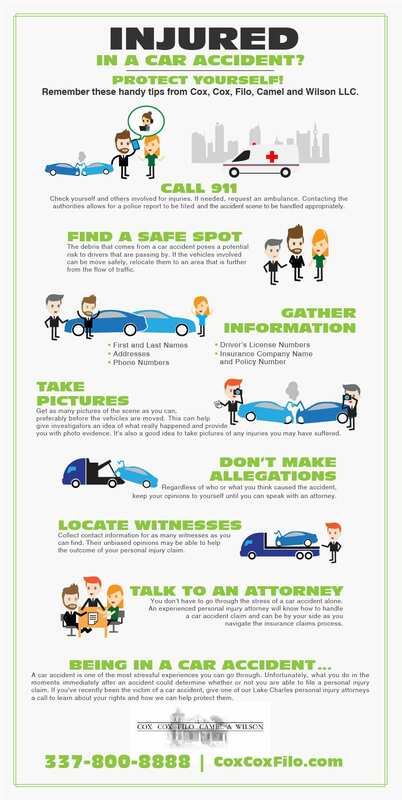 If there were any witnesses, try to collect their contact information as well. Ask if they’d agree to provide a statement to the police or to your insurance company. Contact your insurance company to file a claim. Be prepared to give them basic details of the crash. You may also want to write a description of the cars involved in the crash, beyond the license plate number (i.e., make, model, condition, etc.). If you can get it, a car’s vehicle identification number, or VIN, could be useful to avoid further complications. In Louisiana, it’s not a requirement to report any accident to the Louisiana Department of Public Safety. When you speak to police or an insurance agent, don’t make statements that accept or place blame on any party. It’s particularly important to avoid admitting potential guilt. The insurance companies, police, and other authorities will sort out fault. Furthermore, before you make a potentially detrimental statement, remember the worst thing you can do is lose your cool. Stay composed to minimize further damage. After speaking with the police, and if you’re lucky enough to have suffered no injuries, you should be able to return home. However, don’t drive a vehicle if you’re not sure it’s safe to drive. If it’s not drivable, get in touch with a towing service who can take it to your preferred or insurance-approved garage. As a precaution, it’s always a good idea to visit your doctor to make sure you aren’t injured. Adrenaline runs high after an accident, and while you may feel uninjured, that may not actually be the case. Always seek medical clearance to avoid claim complications down the road. What you do in the moments immediately after an accident can determine whether or not you’re able to file a personal injury claim. Once you’ve completed the steps above, your next step is to find an attorney who is experienced with car accident claims. At Cox, Cox, Filo, Camel & Wilson, we have decades of experience and a proven record of results. If you’re involved in a car accident and you’d like to file a personal injury claim, contact Lake Charles office at 337-800-8888 for a free consultation, or contact us online to get started now. A car accident is one of the most stressful experiences you can go through. Unfortunately, what you do in the moments immediately after an accident could determine whether or not you are able to file a personal injury claim. If you’ve been the victim of a car accident, give one of our Lake Charles car accident attorneys a call to learn about your rights and how we can help protect them 337-800-8888.